It is fair to say that the HFP view so far on the promises of major improvements in Club World business class is sceptical. It has, after all, taken a year to roll out a new blanket across the network. BA couldn’t even get that right, as the original batch was apparently the same colour as the aircraft carpets and had to be scrapped as a trip hazard …. Yesterday, however, came some very interesting news. British Airways is ditching its current caterers. This means goodbye to Gate Gourmet and DHL at Heathrow and Alpha at Gatwick, although Gate Gourmet will continue to provide inbound catering on some routes. Here is the shocker. The Heathrow contract has been given to DO&CO. If you’ve never heard of DO&CO, they are effectively the Mercedes / BMW of the airport catering world. 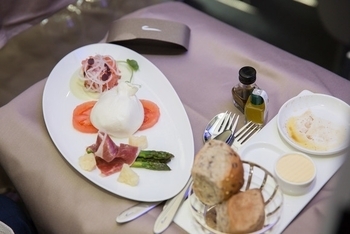 They are responsible for catering on Austrian Airlines which is the best regarded long-haul European airline for business class food. DO&CO was already providing the catering on the New York JFK and Chicago routes but did not have the capacity at Heathrow to do more. This new contract launches in 2020 and presumably runs long enough to justify DO&CO investing in new facilities. In reality they may end up buying the current Gate Gourmet operation. When British Airways originally launched its upgraded Club World catering proposition – you may remember Anika’s lengthy article on the press launch which involved a specially chartered aircraft – the food they presented to the media was DO&CO. There was an implication that DO&CO was taking over the entire operation. It came as a bit of a shock, a few months later, to realise that – on routes apart from JFK and Chicago – the new Club World catering was generally the same old Gate Gourmet stuff on fancier plates. Of course DO&CO can only work with the money that British Airways is prepared to spend, but it would be odd to bring in a high-end caterer and then not give them the money they need to do a proper job. Over at Gatwick, catering is being taken over by Newrest. Newrest currently supplies catering at London City for CityFlyer and inbound from Santiago, Lima, San Jose, Accra, Lagos, Cape Town and Johannesburg. As usual, the proof of the Club World pudding will be in the eating, but this is positive news. Maybe BA will now get a 5-star Skytrax rating for this? Like Lufthansa did for promising to put in better business class seats at some point in the future. Rob – can you do an article at some point explaining how Skytrax ratings work and what influence them. Few people have a clue and you might have insights as an industry insider or get those from your sources. Thanks in advance! No-one knows, but there certainly appear to be ways of gaming the system. There is nothing more ‘official’ about Skytrax than a HFP airline award. Just come back AMS-LHR and Lon and behold DO&CO meal, looking much nicer than usual fare. Very tasty according to my wife…..
Just flew club HRW to JFK. Food the best I’ve had from BA in club World. A marked improvement all round. ???????? Will they be changing the number of courses too? Flew LHR-SIN in BA Business a few weeks ago and was surprised dinner consisted of starter and main (no desert). You’re surprised you weren’t offered the Sahara? It’s a little-known rule that BA is trying to improve the literacy of the populace by only offering things to people who can spell them ???? IRL of course you could always have asked for one, e.g. at the point at which they took your tray away. Who provides catering for F out of LHR? Flew to DXB a week or so ago and I was pretty impressed with the food. Nicely presented too. Flew CW yesterday (LHR – SAN) and couldn’t complain about both meals. The late meal was a steak sandwich which was a little tough, but the Trout terrine and chocolate and almond cake with custard was pretty good. If anything the biggest let down was Galleries South which had very little seating and pretty poor selection of hot / cold food. I wish they’d let you know earlier if you’re flying from B, at least then you can enjoy a less busy lounge.